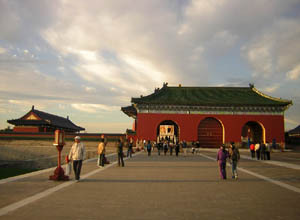 Tour Description: Upon arrival at Beijing airport, be picked up by our private English-speaking tour guide, who will hold a sign with your name on for you to recognize. First, drive to the Mutianyu Great Wall, which boasts beautiful landscape and less crowded than other great wall sections. Then transfer to the majestic imperial architecture-Temple of Heaven where emperors held grand worship ceremonies to heaven for a good harvest. Finally be escorted back to airport. Thank you for using our service! Hi, a friend and I will be flying from Nanjing to Beijing on March 17, arriving at 3:55 p.m. Our next flight leaves the Beijing Airport 10 hours later, at 2 a.m. We have tourist visas already. What sights can we see? I would love to see the Great Wall, but I fear that it will be closed by the time we get there. Could you please advise? Thanks! According to your arrival time, most of Beijing attractions will be stop selling tickets by then. We recommend you visit the Tiananmen Square and Hutong area. Hi. We will be in Beijing on dec 25 5:20 am layover heading to shanghai at 5:30 pm flight. We have China visas so I believe leaving Beijing airport for a short tour should not be a problem. Planning to go to mutianyu and the temple of heaven tour. Just wondering if the weather is not favorable to go to mutinyiu, can we make any changes? We would like to visit forbidden city and Tiananmen Square but close on mondays. Any suggestion? If the weather is not favorable to go to the Mutianyu Great Wall (it is infrequence), we can arrange you to visit the Juyongguan Great Wall or Summer Palace and Temple of Heaven. The tour price will be the same. We have sent you an email about detailed tour itinerary, please check it out. 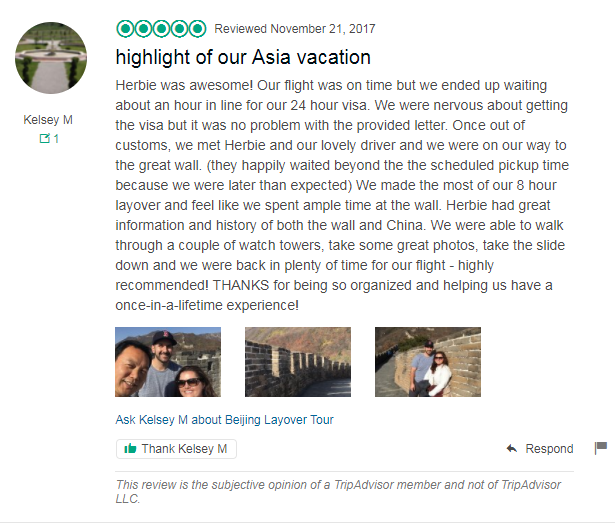 Hi, I am interested in your mutianyu-great-wall-hutong-layover-tour-from-beijing-airport. My flight arrives at 5am and my connection is at 20:30pm on May 30th. As I understand the forbidden city is closed on Monday, would I still be able to get a glimpse of it? I mean outside and near the gate views? What other attractions such as Tiananmen square can be seen during the layover? Also, can you please quote the price for all? I will be alone. Thank you for your message. Yes, you can exterior visit Forbidden City at Tiananmen Square. We just sent an email about detailed itinerary and price, please check. Hi I have a layover in Beijing on September 19th for 12 hours and 55 minutes. I land in Beijing at 1:05 am and leave at 2:00 pm. Since my layover begins so early in the morning I probably can’t start the tour till about 5:30 am so I was thinking that I’d only be able to see the great wall. I was interested in going to the Mutianyu Great Wall and I also wanted to do the toboggan ride there, would that be possible? Can you send me the prices and times for the tour?? Thank you! Our earliest pick up time is 6:30am. So you can only visit Mutianyu Great Wall. Yes, you can to do the toboggan ride at Great Wall. We sent an email to you already, please check. Thank you for your message. Our travel advisor has been sent a detailed itinerary and price to you, please check. Any questions are welcome.